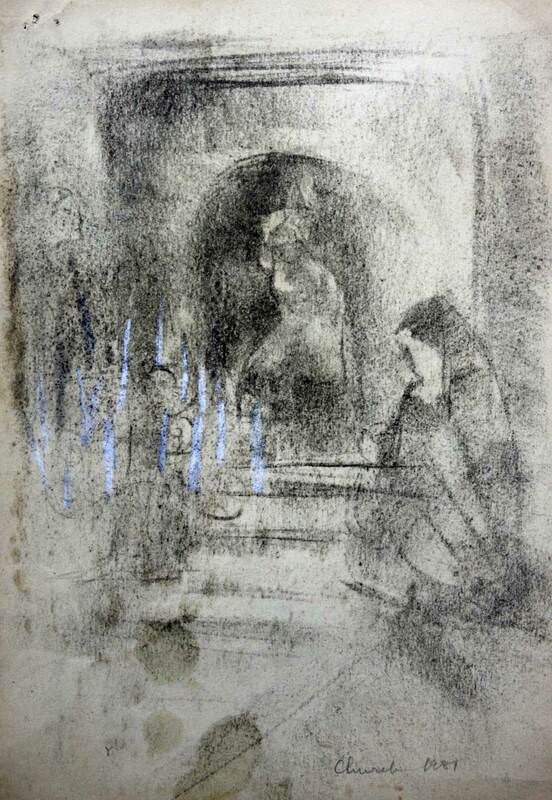 description A half-length portrait of a red-haired woman seen in left profile, her back towards the viewer, as she stands hands clasped in the act of prayer before a statue of the Virgin Mary, which is surrounded by devotional candles. The candlelight lends the background a hazy, Impressionist quality emphasised by the opaque palette overlaid with white using vertical brushstrokes. Although the woman's face and figure are only loosely outlined, the texture of her dress and strands of her hair have been picked out, the latter with the end of the brush. 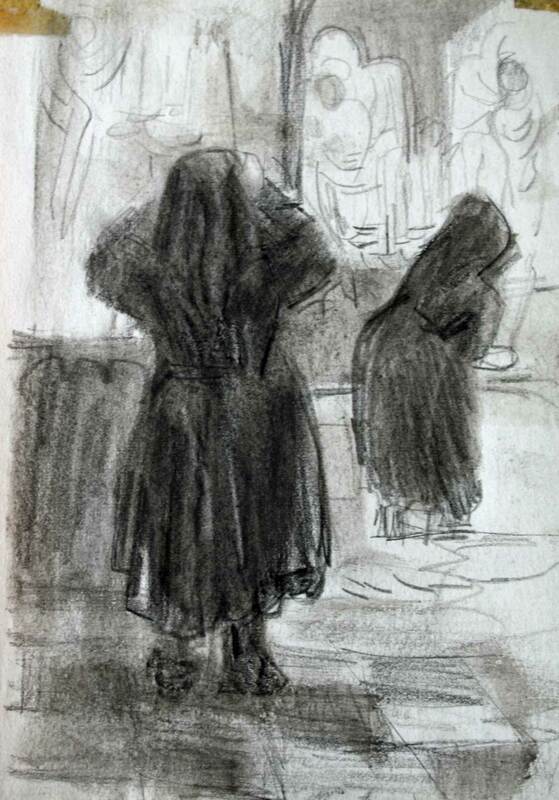 Frankfurther depicted figures from the Jewish, Christian (Catholic) and Greek Orthodox traditions, both at home and abroad, although only Catholic worshippers, including in 'Church, Italy, 1951' and 'Greek Church Athens, 1958', are captured in the act of prayer. The setting for this work is Whitechapel. 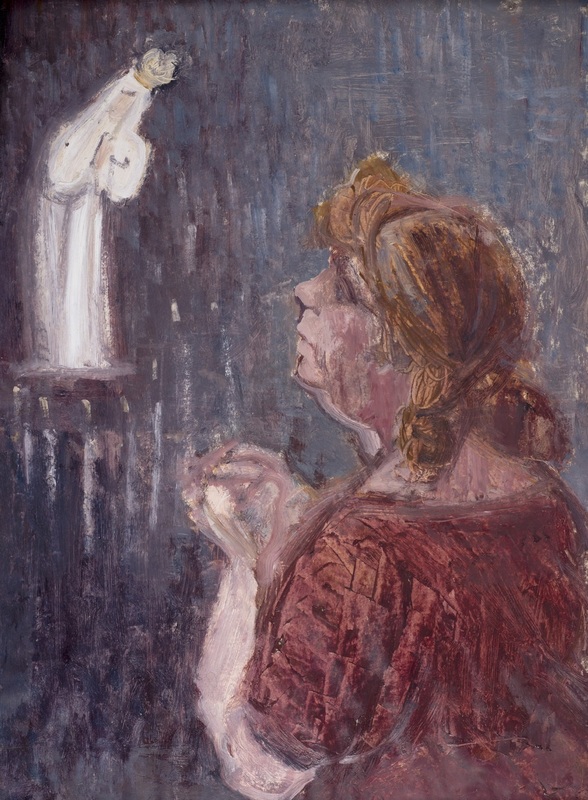 exhibition history 'Eva Frankfurther 1930-1959: Retrospective Exhibition', Ben Uri Art Gallery, 14 Berners Street, London W1, 14 Feb-9 March 1962, (29), as 'Praying Woman'.